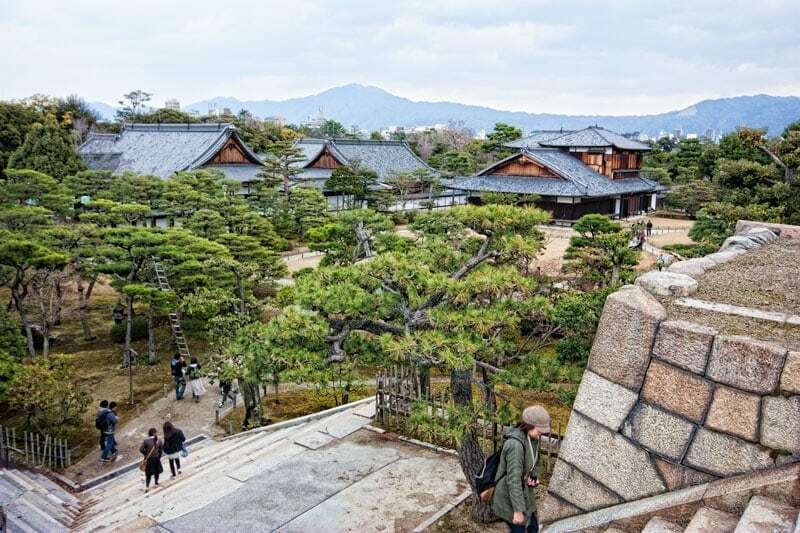 Nijo Castle is one of the must see spots on our Kyoto list. We were really surprised to hear several visitors to the city say they weren’t going because there’s ‘no point when there’s no castle’. It is true that the main tower of Nijo castle burned down centuries ago but there are still plenty of other reasons to visit. Nijo is one of the more complete examples of a castle complex in Japan. It earns its place as a world heritage property for these many cultural assets. While several castles in Japan have retained the main castle tower often other aspects of what it once was are lost in time. Castles such as Himeji and Hikone do have original towers but the full site has not been retained as completely as Nijo when those towns were build up around it. In many instances the gardens, outer moats, other buildings and layers of fortification have been lost in time. The castle was established in 1601 when Tokugawa Ieyasu decreed that the feudal lords of western Japan must contribute to it’s construction. Ieyasu was an important figure in Japanese history as the first Shogun and founder of the Tokygawa shogunate that fundamentally ruled the country from 1600 – 1868. The Ninomaru Palace in the outer circle of defense was built first as the residence and offices of the shogunate. The 5 story castle tower and Honmaru palace in the interior circle of defense was completed in 1626 during the time of his grandson Tokugawa Iemitsu. 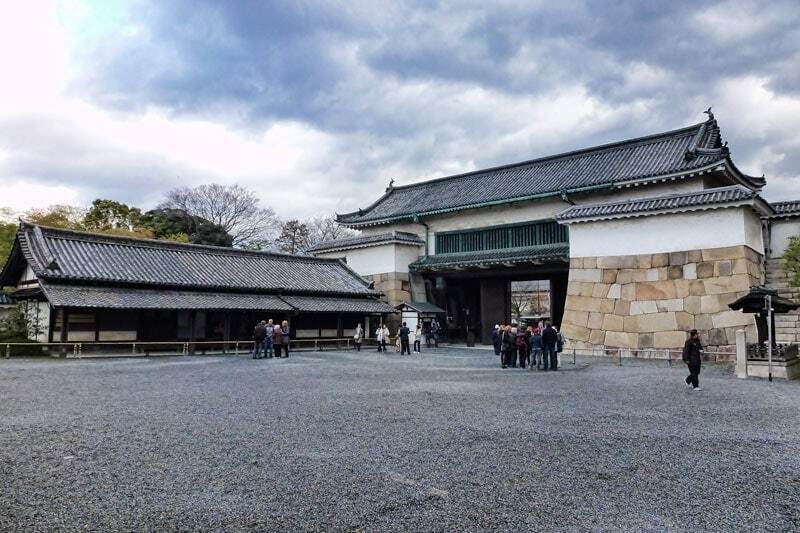 While the Tokugawa shoguns continued to treat Edo (Tokyo) as the capital, the Imperial Palace at the time was in Kyoto so the shogunate kept this impressive residence nearby. In August 1750 a lightning strike hit the castle tower, the resulting fire burned it to the stone foundations. Disaster struck again in 1788 when a great fire swept Kyoto, it claimed the Honmaru Palace. Neither the castle or the palace were ever rebuilt. In 1893 the palace of the Katsura Imperial family was relocated to the site from the Kyoto Gosho palace to become the new Honmaru Palace. The beautiful Honmaru gardens were also created at this time. The precursor of this change from a shogunate palace to an imperial one was of course the return to imperial rule in 1868. Known as the Meiji restoration the leaders of 40 feudal clans ended the Edo Bakufu government and returned power to the Imperial throne. In 1939 the Imperial household donated Nijo Castle to the city of Kyoto and in 1994 it was inscribed on the World Heritage list. The grounds today are still complete and feature two concentric rings of fortification walls and wide moats. In many other castles the outer moats were filled in and lands cribbed from the castle ground to make way for growing town. Despite the immense value of the land that Nijo stands on it’s remained intact in central Kyoto city. The Ninomaru palace complex is a series of five buildings that connect on the diagonal, a shape compared to a flock of flying geese. As the palaces of Edo castle (Tokyo) and Osaka castle have been lost Nimomaru has provided a lot of information about the design and structure of the period. This is the Guard House and the largest building in the complex. Rooms here were used by the shoguns retainers, others were lounges where the feudal lords and Imperial messenger waited for an audience with the shogun. The Shikidai is the reception room and the smallest building made up of only two rooms. The highest ranking councilors of the military government would be based in here when the shogun was in residence and convey greetings and gifts from visitors to the shogun. Ohiroma is the grand chamber that was used for meetings with feudal lords. At 92 tatami mats in size it was great in both size and opulence with its tiled ceiling and heavily decorated wall panels. The shogun would sit on the raised floor of the Ichinoma chamber while the feudal lords would sit below in obeisance in the Ninoma. The white paper screens shown on the outside corner below could be opened to provide an impressive sweeping view of the garden. The forth section was the shoguns personal inner audience chamber. The tiled roof styling of the Ohiroma continues on through here. 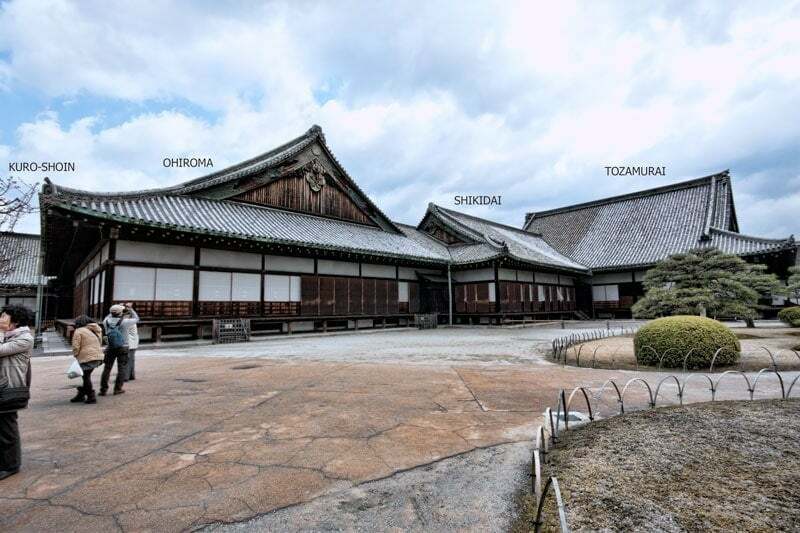 The areas is also styled with an ichinoma and ninoma used in the same way as the grand chamber to ensure the shogun retained the higher physical position and others looked up to him. Finally the shiro-shoin was the Shoguns personal residence comprising his sitting room and bed chamber. While beautifully decorated with ink sketches this private area was less lavish in its opulence and decoration than some of the other rooms. If you’ve heard or read much about the time of the samurai and ninja you will probably be familiar with the concept of the nightingale floors. If you’ve not heard of them then me telling you that you have to visit a place because the floors squeak is going to sound a little crazy but the tone and ‘song’ of these floors, plus the imagery of all those stories of intrigue and espionage, made it a must do for me. Between the entrance to the Ninomaru Palace and the Ohiroma (the most important reception hall where the shogun would receive his visitors) you may be able to hear the singing floorboards announcing the arrival of a visitor. 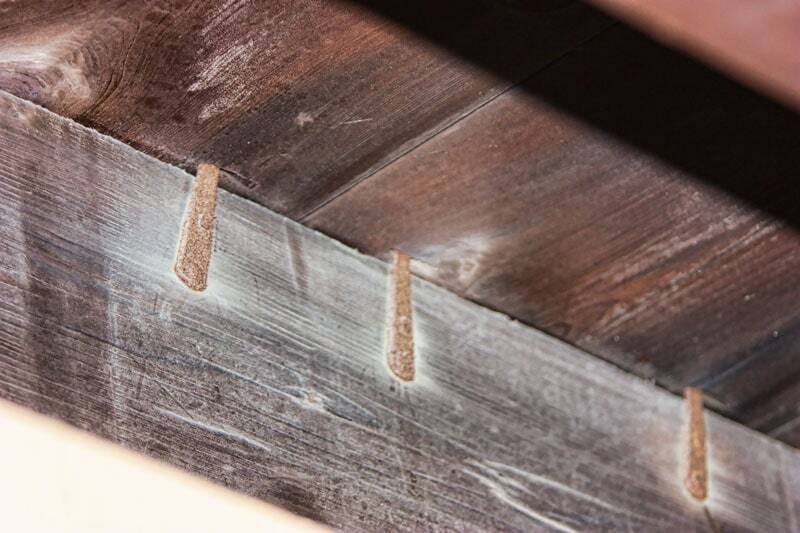 The chirping is created by wedges pushed up into the floorboards on the underside of the floor, the weight of someone walking over it causes the floor to move on the wedge rubbing it against nails near the beams and creating the noise. In Japan these floors are referred to as uguisubari or bush warbler floors. A bush warbler is a bird common around Kyoto with a beautiful song that led to it being known in English as the Japanese nightingale, hence the English name for the technique. The floors were designed as a counter measure against thieves or spies and assassins, the ninjas of feudal Japan. They were complex and expensive, not something that was common but the homes of the top shogun and some other buildings did employ the technique. The photo below shows how the floor is created but this was taken at Chion-in temple in Kyoto on the overpass walkway which is much easier to access and observe the technique in use. 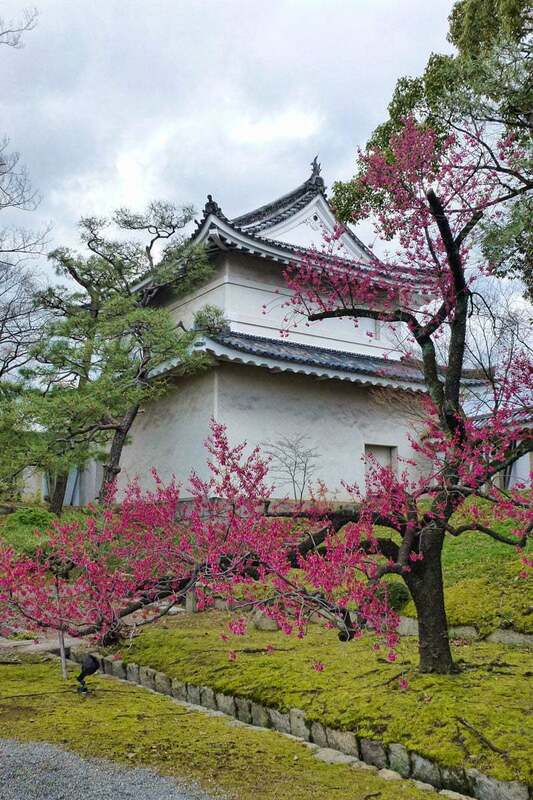 There is no one right season to visit Nijo castle, the famed gardens are worth a visit in any season but as with much of Japan the spring blooms and autumn colours are perhaps the most popular. If you time it right you may also visit an evening light up event. We were a little early for peak blooms on this visit and when we returned to Kyoto a week or so later to a full flush of cherry blossom we had such a list of locations to visit we didn’t make it back here at night. There are several ways to get to Nijo Castle in central Kyoto depending on your starting point, personal preferences and available time. The first option is on foot. Kyoto is a great city for walking, it’s flat and much of it is compact for grouping highlights together. You might have read of our love for wandering around this beautiful city in our series on walking Higashiyama (the eastern hills area). We plan a central Kyoto version soon which will include Nijo Castle. From Kyoto station it is 4km by a direct route, from a more central location such as Nishiki Market or the nearby Daimaru it’s 2km. The second option is to use the bus system which is the cheapest option for getting around Kyoto. A day pass will cost you Y500 and you can jump on and off as you want but it can be crowded and the bus routes are convoluted making it a slow way to get around for shorter distances. If you are using the bus to get to Nijo Castle the Raku 101 bus is a good option, it’s a tourist bus so announcements are made in English and the route is less convenient for locals so it often seems to be less crowded. This one covers the central west area so works for not only Nijo Castle but the Golden Pavilion, Ryoanji, Kitano Tenmangu shrine and the Nishjin textile centre if you’re interested in a free kimono fashion parade. The subway is the third option and the one we ended up using because of the combination of activities we had planned for the day. You want the Nijojo-mae stop and from Kyoto station will cost you Y600 each way, the subway comes out at the convenient south east corner of the castle grounds. There is a day pass for the bus and subway available for Y1200 if you have a few stops planned. If you have a JR pass or prefer the train it’s only Y190 from Kyoto station on the Sagano line but it’s south west of the castle and is about a 1.5 km walk to the entrance. This option is really for anyone arriving at or staying near Kyoto station as unlike the bus and subway it doesn’t pass through the main city areas. Nijo castle is open from 8.45 am until 5 pm. Admission closes 1 hour prior to closing time. The Ninomaru palace opens from 9am until 4pm. It is closed from 26 December until January 4 for the new year celebrations. We were also told it closes on Tuesdays during some months of the year (January, July, August, December). 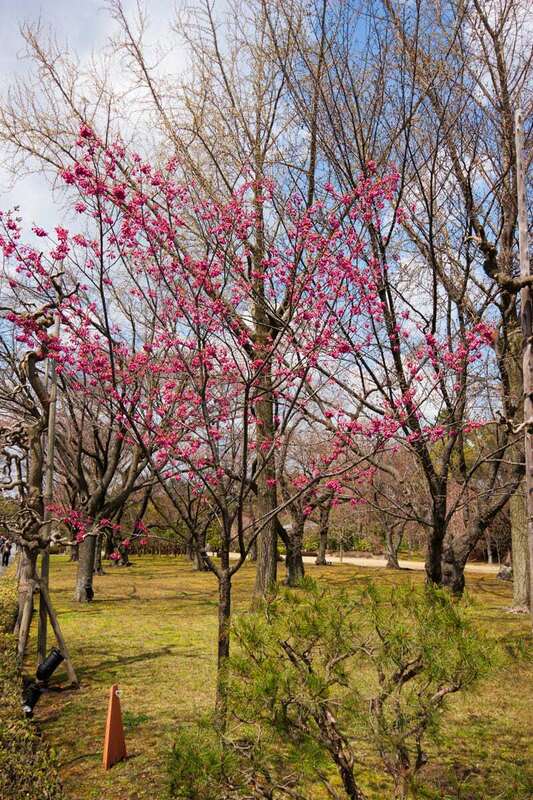 There are extensive cherry blossoms and trees providing autumn colour through out the grounds around the Ninomaru and Honmaru palace. There are spring and autumn special openings where the grounds are lit and open into the evening. During this spring openings there are many young women walking around in kimono and yakata and we were told by one group of friends that they received free entry to many of the temples and historic spots when in traditional dress which is a great incentive for them to dress up. There are public restroom facilities, a tea room and souvenir shop on site. There are also english audio guides available for hire for Y500. Some people seem to like these but after trying them once on our first trip at the silver pavilion we found it frustrating so worked it out the best we could ourselves as we went around. Have you been to Nijo Castle? What were your thoughts, would you recommend it to someone visiting Kyoto city? I’m going to Kyoto next year and I haven’t decided on the itinerary yet but I’ll definitely keep Nijo Castle in mind! Have a fabulous trip Danial, it’s a great ity to explore and spend some time immersing yourself in. Learned so much about the bush warbler floors. I would love to hear the chirping from the boards one day. I wouldn’t pass this up just because there isn’t a castle, to be honest the nightingale floors is a good enough reason- what a practical yet pleasant idea. I still haven’t been to Japan..it’s definitely one of those places that I NEED to see. I’ve been reading so much good things about it. I love Nijo Castle, it is so beautiful and the gardens are truly amazing, had a great time visiting there. 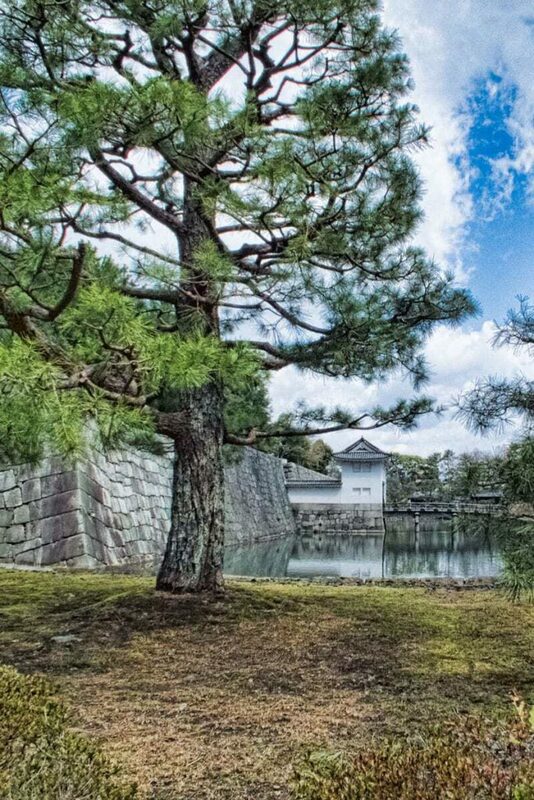 Amazing photos of Nijo Castle! And good job for detailing its history. I’ve been fascinated with Japan especially the Shogunate era ever since I was little because of anime. So Nijo, and Kyoto as a whole is high on my list for Japan. Thanks for sharing! Almost forgot about visiting this place. This is why I need to review my notes after traveling–especially after walking around for hours in the heat. This was one of the amazing stops in Kyoto despite my heat exhaustion. We’ve not been to Japan in the heat of summer, although we live in a sub-tropical climate I’m not sure I’d hold up well in Japans hot season with the amount of walking we do over there. There are so many things that I want to do in Japan! This castle looks and sounds incredible! What a great way to spend a day! One of the most magical days I have ever had included a visit to Nijo Castle in Kyoto, totally and absolutely worth visiting. Especially loved the food we found there too. Yum! I was just wondering if this was a worthwhile place to stop by. Glad I came upon your post so I could see your perspective. We’re going in a month or so. I think it would be worth it still. It looks like a really large place with lots to see. There are so many great places to see in Kyoto and based out of Kyoto Laura it’s hard to choose. How long are you there for?